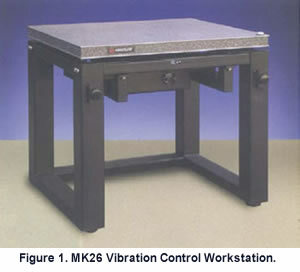 Minus K® Technology, Inc., in a joint venture with Kinetic Systems, has released the MK26 Series Vibration Control Workstation™. The unit is specifically designed for ultralow natural frequency applications and negative stiffness vibration isolators to provide a compact, passive vibration isolation workstation with excellent vertical and horizontal isolation efficiencies. Based on field testing and user evaluations, the Minus K 1/2-Hz vibration isolation workstation performs about 10 to 100 times better than high-performance, pneumatically isolated tables, depending on vibration isolation frequencies. Better than active or electronic-cancellation systems, the MK26 Series can be configured for a wide variety of applications and customized with a broad range of vibration isolation workstation accessories. Minus K negative stiffness vibration isolators employ a revolutionary concept in low-frequency vibration isolation. Vertical-motion isolation is provided by a stiff spring that supports a weight toad, combined with a negative-stiffness mechanism (NSM). The net vertical stiffness is made very low without affecting the static load-supporting capability of the spring. Beam-columns connected in series with the vertical-motion isolator provide horizontal-motion isolation. The horizontal stiffness of the beam-columns is reduced by the "beam-column" effect. (A beam-column behaves as a spring combined with an NSM.) The result is a compact passive isolator capable of very low vertical and horizontal natural frequencies and very high internal structural frequencies. 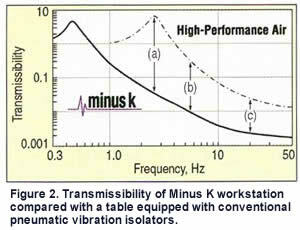 Minus K isolators (adjusted to 1/2 Hz) achieve 93% isolation efficiency at 2 Hz; 99% at 5 Hz; and 99.7% at 10 Hz. The MK26 provides for easy adjustment, A vertical load adjustment crank is a simple manual adjustment that compensates for changes in vertical load; the vertical load adjustment indicator lets you easily determine the optimum setting using this simple visual indicator; the vertical stiffness adjustment screw lets you easily dial in a guaranteed 1/2-Hz or less vertical natural frequency. The unit has a maximum load capacity of 700 lbs, a maximum tabletop width of 48 in, and maximum tabletop depth of 36 in. "The MK26 Workstation, as with all Minus K products, represents an important enabling technology," says Dr. David L. Flatus, president and founder of Minus K. "By reducing building and floor vibrations to ultralow levels, these systems enable vibration-sensitive instruments and equipment to perform at unprecedented levels." Minus K Technology was founded in 1993 to develop, manufacture and market slate-of-the-art vibration isolation products based on the company's patented negative-stiffness-mechanism technology. Minus K products, sold under the trade name Nano-K®, are used in a broad spectrum of applications including nanotechnology, biological sciences, semiconductors, materials research, zero-g simulation of spacecraft and high-end audio. The company is an OEM supplier to leading manufactures of scanning probe microscopes, microhardness testers and other vibration-sensitive instruments and equipment. Minus K customers include private companies and more than 200 leading universities and government laboratories in 35 countries.